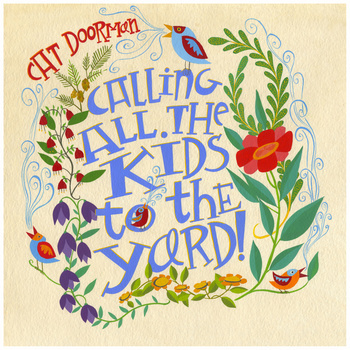 Check this out: Cat Doorman – Calling All the Kids to the Yard! Cat Doorman (aka Julianna Bright) is back with a new EP! Calling All the Kids to the Yard! takes a quick little jaunt through a garden of fresh, rockin’ songs. Making a perfect companion to the ethereal Songbook, Bright’s kindie music debut, Calling All the Kids to the Yard! kicks things up a notch with 4 sprightly tracks eager to make you dance. One of the many things I admire about Bright’s music is the cohesion between the vocals and instrumentation. Accents such as the piano or hand claps are perfectly timed and in sync with the meter of the song, as well as Bright’s bouncy vocals. There is clearly a lot of thought put into the production of her work! Each track, infused with beautiful themes such as peace, love, kindness, and wonder, are filtered through inspiring words that are refreshing to hear. “Drink this cup” picks up where “Peaceful” (from Songbook) left off. “Peaceful” ends with the lyrics “This life we choose, it fills our cup/ This life we choose, it gives so much,” and “Drink this Cup” opens with Bright gratefully declaring that it’s time to “Drink this loving cup” and be nourished by the beauty life has to offer. “Wake Up” encourages kids to move through their day with kindness and an open heart while the title track encourages community building and care for the environment. “All the Pretty Little Horses,” is taken from a saunter to a canter as it urges you to “Kick up your hooves” and shake your tail, which you certainly will. Bright’s playful take on this classic showcases her hip style and dynamic range as a musician. I love Bright’s style and am really enjoying the upbeat swing of this EP. Calling All the Kids to the Yard! is the first in a series of 4 seasonal EPs that are set to release over the course of this year. You can purchase this digital only release through the Bandcamp widget below. For more Cat Doorman, check out Bright’s recent DJ spot on the Hilltown Family Variety Show, and her interview with the The Oregonian.